President Hu Jintao and his Russian counterpart Dmitry Medvedev on Friday signed a joint statement outlining their coordinated stance on major international issues. According to the paper, the two countries have taken a similar position on the Teheran and Pyongyang nuclear issues, as well as on Kosovo independence and the conflicts in Darfur, Sudan. They called on all parties to refrain from military and extreme action against Iran. "China and Russia propose the Iranian nuclear issue be resolved through dialogue and equal consultation," it said. 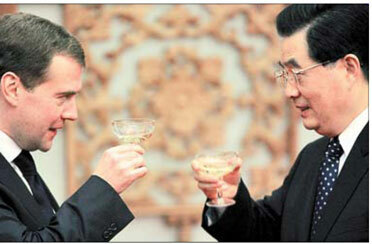 The seven-page statement was signed after the two leaders held two-hour talks in the Great Hall of the People. "All parties should consider global and regional security, make diplomatic efforts, refrain from military and extreme means, cautiously resort to sanctions and take into account the interests of the country involved," the statement said. Both opposed the missile defense plan by the US, without mentioning the name. Some countries' security cannot be guaranteed at the cost of some others', including expanding military and political allies, the statement said. "The establishment of a global missile defense system, including its deployment in some regions and relevant cooperation, is not conducive to strategic balance and stability," it said. It added that the global missile shield hinders international arms control and non-proliferation efforts and weakens confidence building among countries. Both China and Russia stand for the peaceful use of outer space and oppose any space arms race, the statement said. Hu said the declaration illustrated the two countries' common position on world affairs, urging the international community to work jointly to tackle global challenges and to move toward peace and stability. The two leaders also found common ground on human rights and fighting terrorism. Medvedev told reporters the statement has "stated our views on many acute international problems". The Russian leader arrived in Beijing a day after visiting neighboring Kazakhstan. The two-day China trip is his first state visit outside the Commonwealth of Independent States since he took office earlier this month. The joint statement on major international issues was one of several deals inked between China and Russia on Friday. The others were on energy, tourism and finance. Media reports quoted a Russian nuclear chief as saying Moscow would build and supply a $1-billion uranium enrichment plant in China. Hu Jintao also thanked Russia for its speedy aid after the May 12 quake in Sichuan. The Russian guest again expressed his condolences and sympathy to the victims and their relatives and families, saying his country is ready to provide all assistance necessary. Medvedev said he will invite some Chinese students injured in the quake to Russia for treatment. Russia has so far sent a rescue team, a medical team, a mobile hospital and several batches of relief materials to China. Hu met three members of the Russian rescue team on Friday night and praised them for their relief efforts in China. Medvedev is scheduled to give a speech at Peking University on Saturday afternoon.